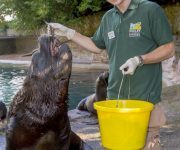 Keepers have been getting the measure of creatures down on the DZG Farm – with some new digital scales. 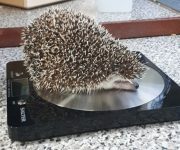 Knox, our pygmy hedgehog, a leopard gecko and Pocahontas the guinea pig were first to test out the new scales. 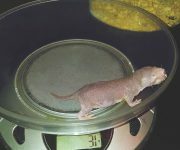 Farm Section Leader Lesley Lewis said: “We weigh all our animals monthly as part of their health … Continue reading Tipping the scales! 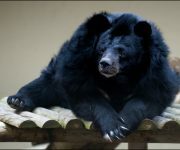 Our amazing Asiatic black bear! Our amazing Asiatic black bear, Inca, has flown through yet another annual health check! The incredible 36 year-old, who’s officially the oldest black bear in Europe, underwent her yearly medical with zoo vets Peter and Elizabeth Stewart, which revealed she’s doing better than ever! Inca, who was sedated in her den for the 40-minute check-up … Continue reading Our amazing Asiatic black bear!